Sure we’ve all read about Freedom and Mockingjay but we likely have a book we wish would get more attention by book bloggers, whether it’s a forgotten classic or under marketed contemporary fiction. This is your chance to tell the community why they should consider reading this book! I’ve often said I love book blogging because it has opened my eyes to a lot of different books/authors/genres that I would otherwise not have been introduced to. That said though, sometimes the book blogosphere can be very repetitive, with the same books being mentioned over and over. 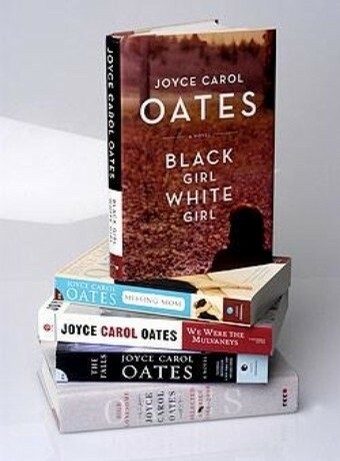 One author that I wish I saw mentioned and reviewed more often is Joyce Carol Oates. 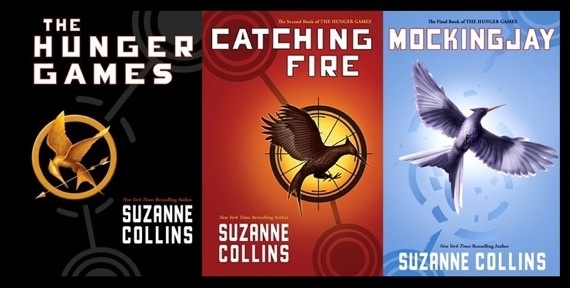 I love how different her books are and she’s been one of my favorite authors for the past few years. Unfortunately, I am guilty of slighting her as well, as I have only read one book by her in the past year. The Falls, Blonde and My Sister, My Love are all Oates books that I really enjoyed. What Oates books have you enjoyed? Library Loot is a weekly meme hosted by Marg and Claire. We invite you to share with us a book or genre you tried due to the influence of another blogger. What made you cave in to try something new and what was the experience like? 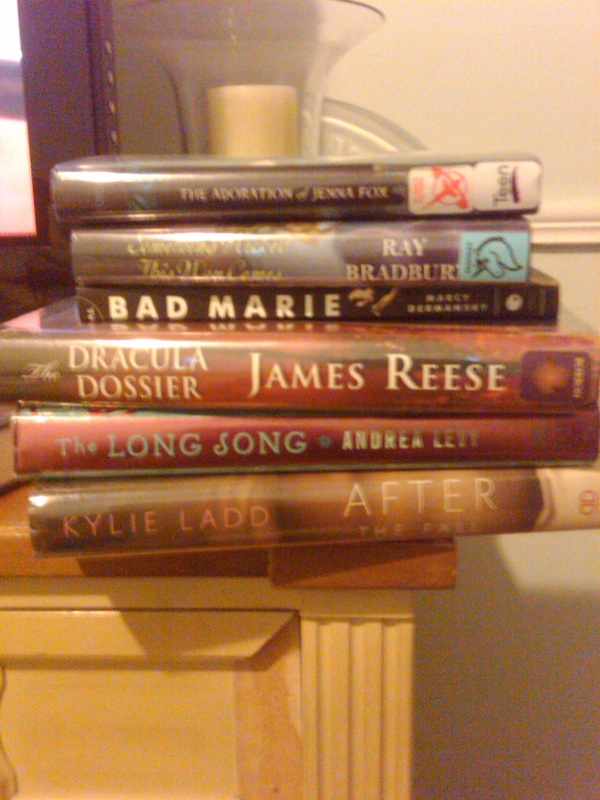 As is normal with my library loot, quite a few of my choices were influenced by bloggers. Sorry about the quality–I have no camera at the moment, so I had to take the picture with my phone! The Adoration of Jenna Fox, by Mary Pearson: I can’t pinpoint one particular blogger that inspired me to get this book. I have seen it everywhere! Something Wicked this Way Comes, by Ray Bradbury: I have seen this one around a lot too because of the RIP challenge. Bad Marie, by Marcy Dermansky: There are a few to blame for this one, namely Jen from Devourer of Books, Nicole from Linus’s Blanket, Rebecca from The Book Lady’s Blog and Jenn from Jenn’s Bookshelf. The Dracula Dossier, by James Reese: This one was Jen from Devourer of Books. She was kind enough to e-mail me this suggestion after I mentioned in her blog comments that I like reading about Jack the Ripper. The Long Song, by Andrea Levy: I have been following Jackie’s Booker reviews on Farmlanebooks Book Blog and this one caught my eye. After the Fall, by Kylie Ladd: I first saw this one on another blog a few months ago and it has popped up now and again since then. Every.single.book I checked out was mentioned first by another blogger! What did you checkout from the library this week? Where would my reading be if I did not read book blogs? I can say one thing–it would not be as well rounded and expansive. Book blogs have opened my eyes to so many different books and genres. The one at the forefront in my mind is . . . I remember last summer when Catching Fire came out. It seemed to be featured and/or reviewed on every blog! At first I thought to myself Those books look ridiculous–no way in heck am I reading them! But then I figured that there must be something worthwhile and entertaining about these books if they were so popular. And the rest is history! 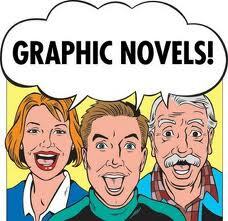 Another genre that I would never have give a second thought to before I started reading book blogs is graphic novels. I am starting to sound like a snob when I say that this is another genre I would never have given a second glance before I started blogging. There’s no good reasoning behind that–I just didn’t think graphic novels were “my thing”, coupled with the fact that I had little to no exposure to them. That all changed when I started reading book blogs, and I eventually gave in and started reading graphic novels. They’re great for those days where you just need something light and you don’t want to get bogged down by a heavy book. So, you tell me–what genres and/or books were you introduced to through the blogosphere? We invite you to share with us about a great new book blog you’ve discovered since BBAW last year! If you are new to BBAW or book blogging, share with us the very first book blog you discovered. Tell us why this blog rocks your socks off and why you keep going back for more. I have decided to put my own little twist on this meme and instead just list my top five book blogs. Jennifer, of The Literate Housewife, is one of the first book bloggers I ever came across. I remember coming across her blog and all of a sudden it became a catalyst for book blogs in general. I love Jennifer’s concise reviews and the format of her blog in general. Jen, from Devourer of Books, was the other book blogger that I discovered at the very beginning. She has always been the type of person that offers help and she is super friendly! I love how her reviews always cut straight to the point. I trust her judgment with books. Meghan’s reviews, which can be found at Medieval Bookworm, are from such an array of genres that I get a taste of everything from her blog. I am always amazed at the amount of reading Meghan does! Fizzy Thoughts is the blog of Jill, aka softdrink. I think you would be hard pressed to find a blog funnier than Jill’s. I rarely read a post without giggling out loud. Make sure to watch out for Jill’s songs as she pumps up all the cheerleaders during the read-a-thon next month. Trish, of eclectic/eccentric, is one of the friendliest bloggers I have come across. She is easy to talk to, and that openness really shines through in her posts. I think Trish’s blog is one of the most relatable out there. Ok, I know I said I was going to highlight five blogs but I couldn’t narrow it down, so I am breaking my own rules and turning my 5 into 6. I confess, sometimes I get a little intimidated by Amanda, of The Zen Leaf. She’s sweet as can be, it’s just that her literary tastes are so refined. Amanda is constantly posting about books that I have never heard of, and thus broadening my horizons.I love how she is able to open my eyes to different types of literature. There are so many other book bloggers that I love and respect. This is just the tip of the iceberg. If you aren’t familiar with any of these blogs, make sure to check them out, as they’re the best of the best! Happy Sunday! I just woke up and I am just lounging around in bed before hubby and I go run some errands. This week I finished Midnight in the Garden of Good and Evil, by John Berendt. I didn’t realize how affecting this book was until I finished it–it will definitely be among my top books of 2010. I then read The Prime if Miss Jean Brodie, by Muriel Spark, which I detested. I just really did not enjoy the writing style and I felt like the characters were poorly written. I am now reading The Historian, by Elizabeth Kostova. Coming in at almost 700 pages, it is definitely quite the chunkster! I am about 250 pages in and loving it so far. It took me awhile to get acclimated as I knew nothing about Dracula or Vlad the Impaler–in fact, I didn’t even know that that is what The Historian was about! I am getting so excited for all the fun stuff going on around the blogosphere this fall. We have BBAW starting tomorrow!!! I love the sense of community that comes along with BBAW and I am very excited to participate for the second year in a row. I am also getting pumped for Dewey’s 24 hour read-a-thon. I didn’t get to join in this past April, so it has been a year since I have been able to participate. I am super excited! Will you be participating in BBAW and/or the read-a-thon?